In this post, you will find an explanation of attention and behavior concerns that interfere with independence in self feeding and resulting meal time problems with kids. Attention and behavior during meal time functional skills are a vital importance to independence with independence in self-feeding. The child with cognitive impairments or unsatisfied sensory needs can impact attention and focus leading to safety concerns, decreased independence, or limited coordination and functional ability to self-feed. Behaviors can result in intentional or unintentional feeding difficulties. The child who is limited in sustained attention or the child who is distracted by sensory needs or interference may be overwhelmingly unable to attend to feeding tasks. Likewise, children with behavioral tendencies may be seeing a satisfaction of other needs that therefore interferes with independence in self-feeding. 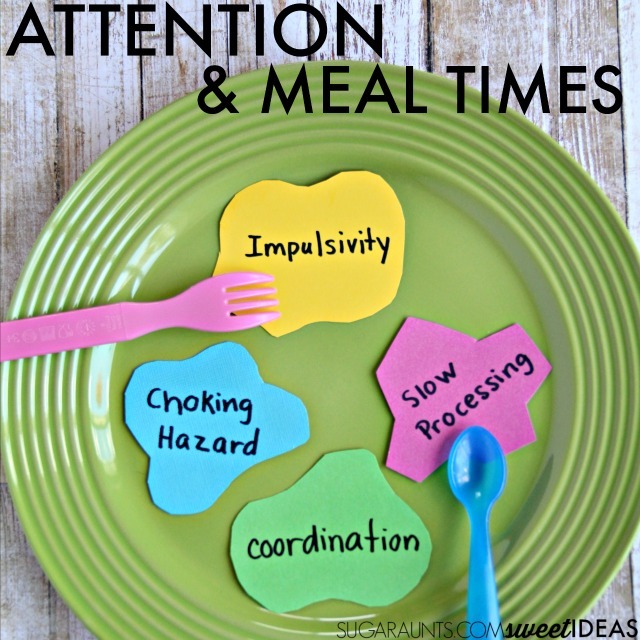 When a child presents with these problem areas, they have an impact on meal time. Development of self-feeding is often times delayed and parents seek answers to help their child feed them selves independently. The peaceful meal time is a sought after experience given that meal times are a time for conversation, reflection, and satisfaction. When behaviors or attention limit a child's ability to self- feed, the meal time can then become focused on safety or become a stressful situation. Other times, meals are a quick operation that needs to be completed in a timely manner in order to allow families to move on to the day's activities. In these situations, meals need to be efficient and energizing. In both scenarios, a child with meal time problems secondary to attention and behavior can effect the family dynamic. Each of the above problem areas are concerns that may be a result of attention and behavioral issues. these patterns assume a typical oral motor and pharyngeal motor development. 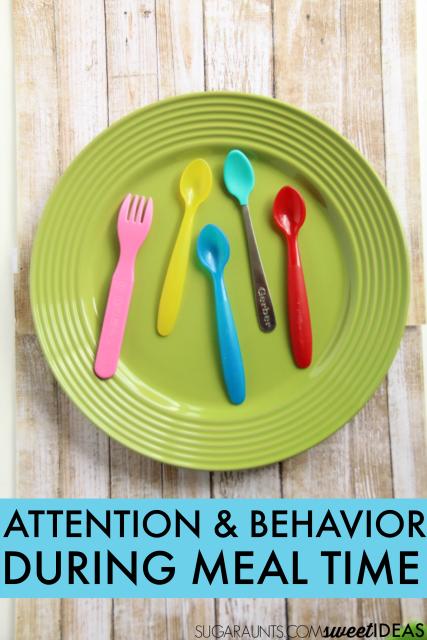 The sensory variances related to attention provide distractors that interfere with attention and behavior during meal time. In many of the examples listed above, the sensory needs or preferences of the child may impact meal time attention and behavior. 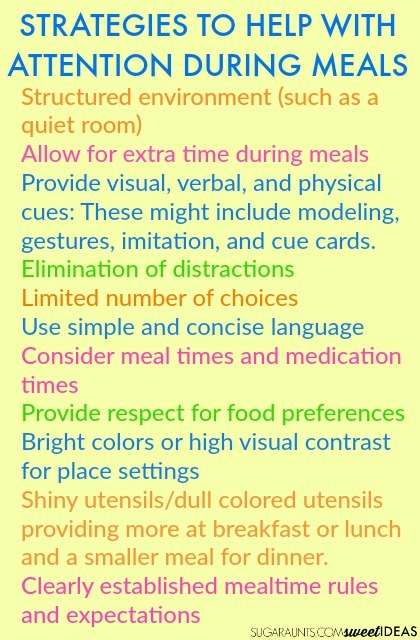 Strategies to address sensory-based attention and behavior concerns should address the child's sensory needs prior to and during meal time. Provide visual, verbal, and physical cues: These might include modeling, gestures, imitation, and cue cards. Provide the biggest meal at various times- Typically dinner is the largest meal of the day in the US. Try providing more at breakfast or lunch and a smaller meal for dinner. 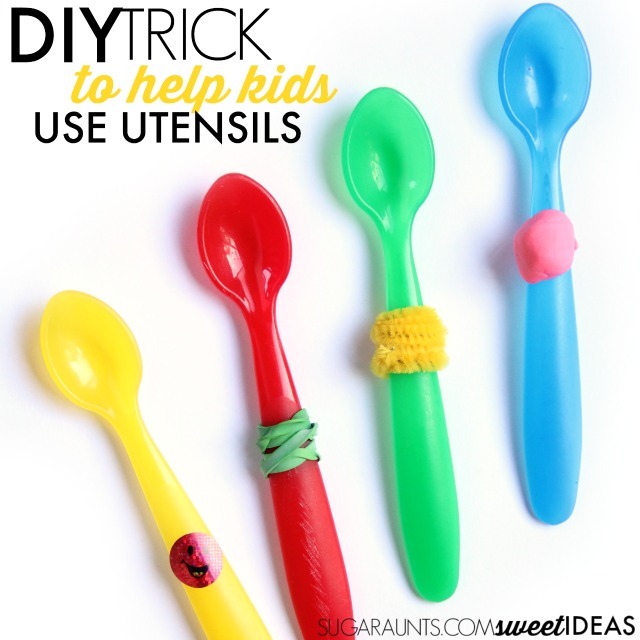 Expect that food will spill, messes will happen, and kids will not always be hungry. Request school lunches have accommodations added to the IEP if needed. Share these ideas on Facebook! 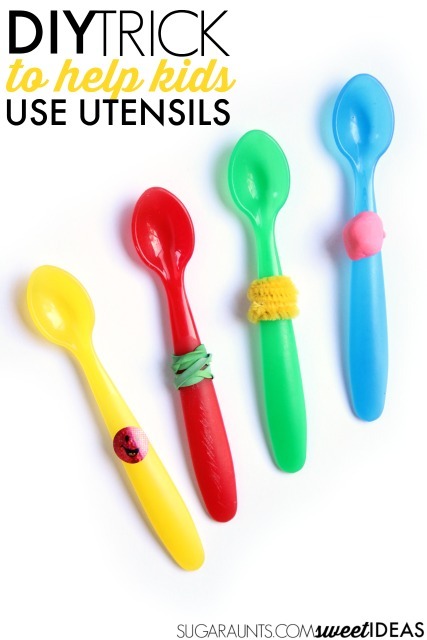 For these ideas, I added a few different prompts right onto the spoons: a sticker, a pipe cleaner wrapped around the spoon, a bit of modelling clay, or a couple of rubber bands are inexpensive ways to bring the child's attention to help with just one concern that attention may impact during self-feeding. 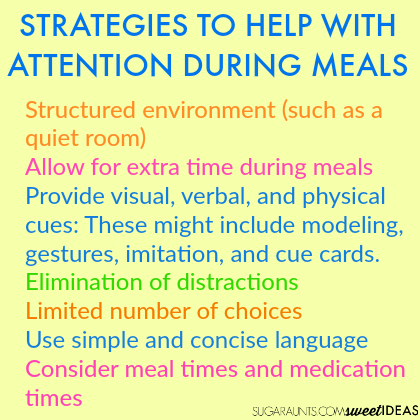 It is important to remember that this list of suggested strategies does not include all interventions that may help kids with attention and behavior problems and resulting difficulties during meal times. Knowing that every child is drastically different with temperament, environment, likes/dislikes, sensory needs, cognitive level, and motor skill, there are myriad interventions that can work to address needs. What works for one child may not work for another. The trick with attention and behavior needs to to try one strategy and then another, sometimes in combination, to meet the needs of the child. Consult an Occupational Therapist for best intervention strategies and plan of action for your child. 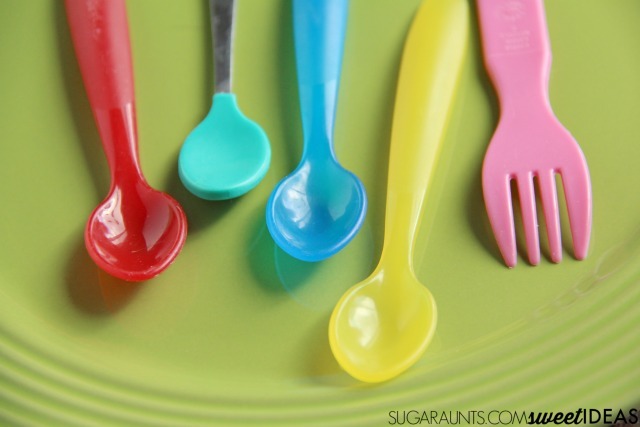 Stop by and see what the other bloggers in the Functional Skills for Kids series have shared to address Meal Time concerns. There are so many strategies to address attention in kids and activities that can help address attention needs. One tactic that can be a big help is analyzing precursors to behaviors related to attention and addressing underlying needs. The Attention and Sensory Workbook can be a way to do just that. The Attention and Sensory Workbook is a free printable resource for parents, teachers, and therapists. 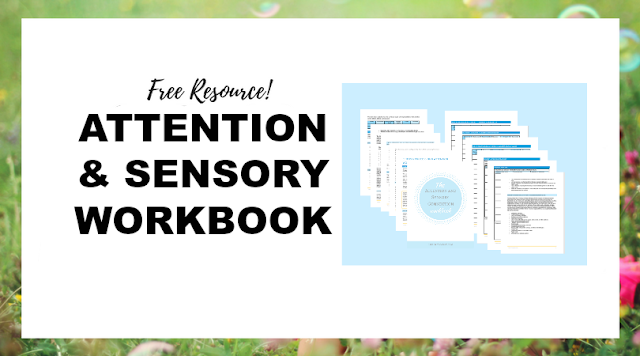 It is a printable workbook and includes so much information on the connection between attention and sensory needs. Sensory processing is the ability to register, screen, organize, and interpret information from our senses and the environment. This process allows us to filter out some unnecessary information so that we can attend to what is important. Kids with sensory challenges often time have difficulty with attention as a result. It’s been found that there is a co-morbidity of 40-60% of ADHD and Sensory Processing Disorder. This workbook is an actionable guide to help teachers, therapists, and parents to help kids boost attention and focus in the classroom by mastering sensory processing needs. The workbook provides tactics to address attention and sensory processing as a combined strategy and overall function. There are charts for activities, forms for assessment of impact, workbook pages for accommodations, and sensory strategy forms. Grab the Attention and Sensory Workbook by clicking HERE or on the image below.